This tutorial is only intended for users running the Internet Explorer 8 browser on Windows operating systems. Anonymity when browsing the web can be important for a variety of reasons. Perhaps you are concerned that your sensitive data may be left behind in temporary files such as cookies, or maybe you just don't want anyone to know where you have been. No matter what your motive for privacy might be, Internet Explorer 8's InPrivate Browsing may be just what you are looking for. While utilizing InPrivate Browsing, cookies and other files are not saved on your hard drive. Even better, your entire browsing and search history is automatically wiped out. InPrivate Browsing can be activated in just a few easy steps. Click on the Safety menu, located in the upper right-hand corner of your browser window. When the drop-down menu appears, select the option labeled InPrivate Browsing. You can use the following keyboard shortcut in lieu of selecting this menu item: CTRL + SHIFT + P.
A new IE8 window should now be displayed, indicating that InPrivate Browsing is turned on. Details are given on how InPrivate Browsing works, as is shown in the example above. Any web pages that are viewed within this new, private window will fall under the InPrivate Browsing rules. This means that history, cookies, temporary files, and other session data will not be stored on your hard drive or anywhere else. All extensions and toolbars are disabled while InPrivate Browsing mode is activated. 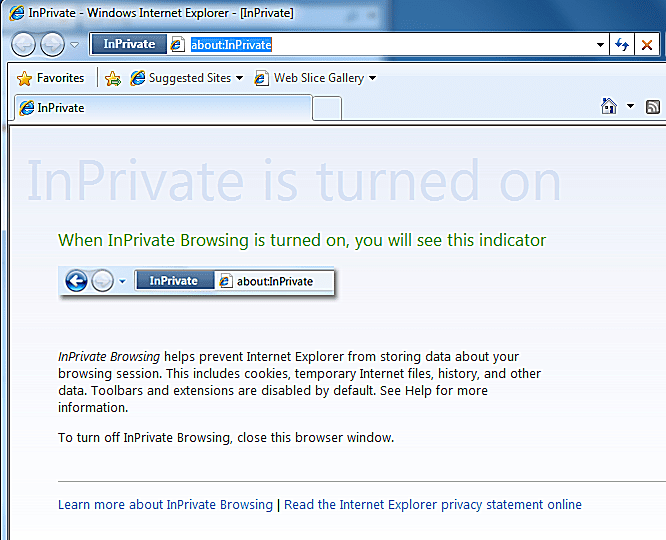 While InPrivate Browsing is activated in a particular IE8 window, two key indicators are displayed. The first is the [InPrivate] label that is displayed in IE8's title bar. The second and more noticeable indicator is the blue and white InPrivate logo located directly to the left of your browser's address bar. If you are ever unsure whether your current browsing session is truly private, look for these two indicators. To disable InPrivate Browsing simply close the newly created IE8 window.